The Littmann Model 3200 Stethoscope (and optional Cardioscan software) is the winner of the 2009 Innovation Of The Year and is also the Grand Award winner in the Health category as voted by a leading science publication. The Littmann Model 3200 is the most advanced Littmann stethoscope that is currently available. This stethoscope will allow you to Hear It, Record It, Send It and Confirm It. Any settings that are modified when using the Littmann Electronic 3200 are remembered for the next time you use the stethoscope- you do not have to keep re-setting the Model 3200. It is ready to use when you need it. The Littmann Model 3200 stethoscope will help to eliminate an average of 85% of background noise. This will help you to concentrate and will make it easier to detect those hard to hear sounds that can sometimes be missed. 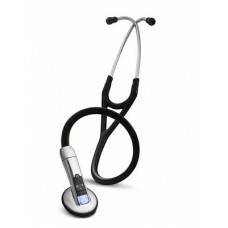 The Littmann Model 3200 electronic stethoscope allows you to record an auscultation sound track for up to 20 seconds. This sound track can then be transmitted via Bluetooth to the software provided with the stethoscope. The Model 3200 stethoscope combines the advanced acoustic quality of the Littmann Model 3100 stethoscope and adds the ability to record sound. You can then use Bluetooth technology to transmit the sounds to your PC, which allows you to further analyze them, save it to the patients records or shared with colleagues for further analysis or discussion. The supplied software will allow you to slow down the sound that you have recorded, and play it over and over again. A blue USB dongle is supplied with the 3200- plug this into your PC and this will receive the transmission from the Littmann 3200 stethoscope. PLEASE NOTE- the USB dongle is hidden in the foam insert in presentation box. If you look closely, there are 2 slits in the foam packaging (where the instruction booklet and software would sit)- one side has betteries, the other has the dongle. The Littmann Electronic 3200 is supplied with software FREE of charge. The Zargis StethAssist Heart and Lung Sound Visualization Software is included and will allow you to visualize what you are hearing, will allow you to playback the sounds and will allow you to store or send the sound to colleagues if required. The Zaris StethAssist Heart and Lung Sound Visualization Software is available in English, French, German, Italian, Spanish, Dutch, Swedish, Danish, Norwegian, Finnish, Portugese and Chinese. The software is compatible for use with Windows XP and Windows Vista. The diaphragm has a large sensor, and this allows for more air to pass through which enhances the acoustic quality. The diaphragm is flat which provides added stability when auscultating. It is the correct size for adults and infants, the 24X amplification is helpful when auscultating obese patients. The chestpiece also incorporates a frictional noise reduction technology, which helps to reduce handling noise. The sensor is also much larger than on previous models, which helps to enhance the acoustic quality. The Littmann Electronic 3200 stethoscope is lightweight and easy to use- the auto on feature means that there is no waiting for the stethoscope to power on- it is ready as soon as you need it. Supplied with a 2 year ear tip to chestpiece warranty. Bluetooth® wireless technology is a short-range communications technology intended to replace the cables connecting portable and/or fixed devices while maintaining high levels of security. The key features of Bluetooth® technology are robustness, low power, and low cost. The Bluetooth® specification defines a uniform structure for a wide range of devices to connect and communicate with each other. (Bluetooth® technology is available only with the 3M™ Littmann® Electronic Stethoscope Model 3200. The Bluetooth® frequency selected is safe to use in health care settings).